The ever-so-helpful theoi.com has tons of information on the mythology of the Gorgons, if you wish to know more about them. We also happen to host some very interesting questions about Medusa and her sisters on this site. Not the answer you're looking for? 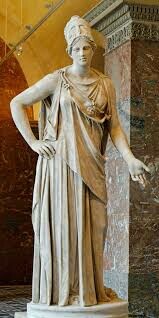 Browse other questions tagged greek myth-identification athena goddesses maiden-goddesses or ask your own question. Is there a myth that dolphins were humans who chose to return to the sea?